The process of ageing is so beautifully penned. Lovely. This is a brilliant bit of writing! Bitter sweet, but tasty. The photo will haunt me for a very long time, as will the layers of words. I love this one! I felt it and that is always wonderful! Thank you for sharing! “dusty divining rod” is good. Beautiful, graceful poetry of aging. So well said, what this old tree would say and how. Absolutely stunning and haunting in equal measure. I really enjoyed reading this collection of beautiful words. 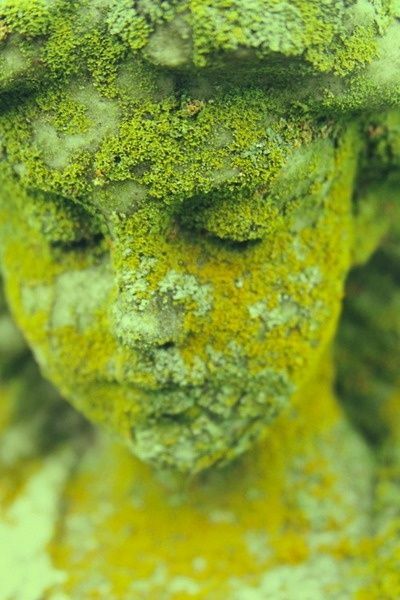 And the picture – the face covered in moss is breathtaking. Did you take the shot? Have a lovely weekend. I really love the way you make words sound so musical. And it’s so easy to get the imagery here, especially with the wonderful photo. Loved it! Your words are lovely and bittersweet, much like the aging process. I remember a time, not too long ago, when I went to lunch with a friend, a lady 30 years my junior. For the first time, I became aware that I wasn’t the one men noticed anymore. But that was okay; I’d had my time in the sun. 🙂 To everything there is a season . . . Wonderful images of aging. A friend and I were talking this morning about how much fun we are having at this surprisingly good time of life. It is exquisite. The face is simply angelic. Gorgeous nose. I love your words, the cailleach is there among them. Perhaps because I can relate more than I would like, this is an instant favourite. Well done!